The Joker looks dapper and dangerous as he rides high atop his own maniacal laughter, a unique and integrated base built of actual 'HA HA HAs.' 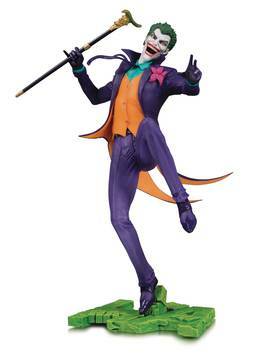 Display the Clown Prince of Crime proudly at home, work or wherever you want to show your crazy side. DC Core is a new line of 9-inch premium PVC statues that appeals to fans of DC and its core characters. Measures Approximately 11' Tall $50.00 US • On Sale AUGUST 2018 Allocations may occur. Final products may differ from images shown.